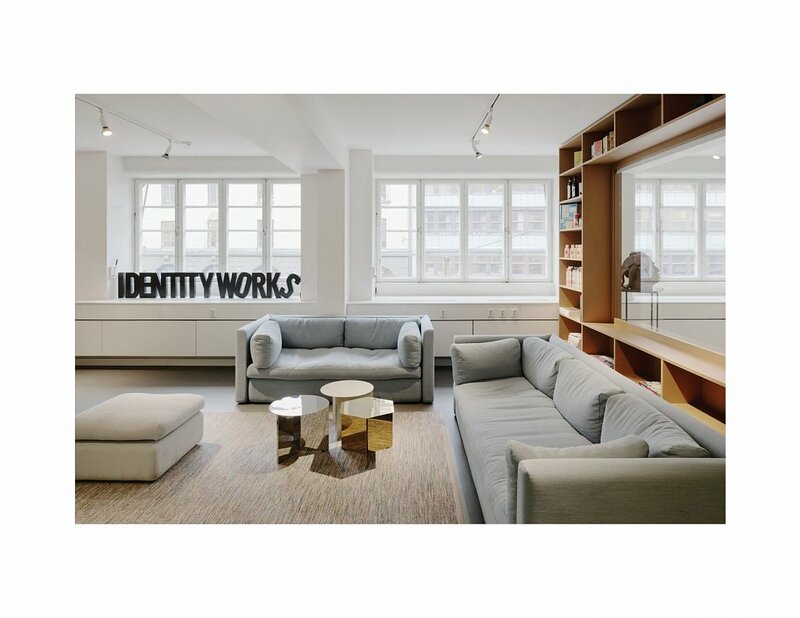 The independent branding agency Identity Works is housed in one of Stockholms most iconic commercial buildings from the Swedish Grace era, designed by Cyrillus Johansson. When expanding within the building Elding Oscarson were given the opportunity to thoroughly look into the agency’s workflow in relation to the disposition of spaces. Within a tight framework of standard requirements, a project tailored for the client regarding openness, transparency, communication, and creative flow, could be crafted. The envisioned creative atelier, however with the need of many enclosed rooms, resulted in a layout where enclosed spaces are arranged to form a series of interconnected open spaces. Like buildings, towards a square, these volumes have been given facades with large windows providing light and transparency. Their contrasting cladding of clear lacquered MDF shelving, highlights the spatial organization while functioning as an ever-changing mood board.